This is still a work in progress so bare with me and I’ll go over the areas I understand.First off we have the conditions with put the ECU into open loop. Open loop as we all know is where the ECU disregaurds the narrowband O2 sensors. For a given RPM the ECU looks up both a minimum engine load and TPS. When both conditions are exceeded the ECU goes into open loop. There are 3 Load conditions. I’m not yet sure what factor the ECU uses to switch between the first two tables, but the 3rd table is used during warm up when the engine coolant temps are less than 140 degF. 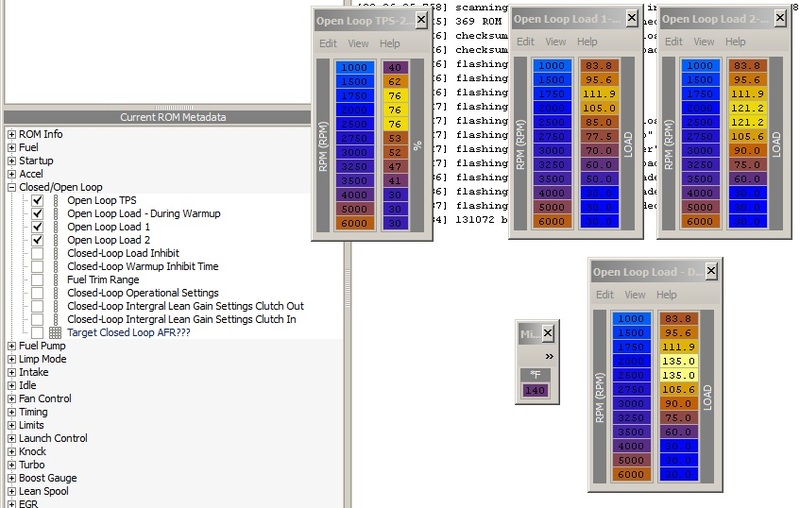 The Load Inhibit table is just a reset value in a sense to re-enable closed loop when the ECU doesn’t detect a change in load anymore. This table is just a timer which counts down the number of seconds after the motor is started before the ECU goes into closed loop and starts to cycle the narrowbands. Might be advantageous to extend this value if you have larger cams to get more consistent fueling during warmup. Lastly we have 3 fuel trims (low, mid and high). The Fuel Trim Range table is simply a percentage modifier to the raw input HZ from the MAF. Much like an SAFC actually. This table differentiates between the 3 trims. As it turns out the enrichment/enleanment factor from your fuel trims are still applied even in Open Loop so it’s best to try to keep those trims as close to 0 as possible while tuning. P (Proportianal Gain): Determins the reaction to the current error calculated. I (Integral Gain): Determins the reaction based on previous calculations. D (Derivitive Gain): Alters the reaction based on how much the error has changed. I call this the feed back gain. Bascially, the higher the numbers, the greater the reaction. There isn’t really any need to play with these at all unless you want to try to make your O2s cycle faster/slower for some reason. Not quite sure what the different zones mean yet. I *think* it might have to do with individual cylinder gain settings.